Goldfish are cold-water fish and can withstand a wide variety of different temperatures, both in aquarium settings and in outdoor ponds. 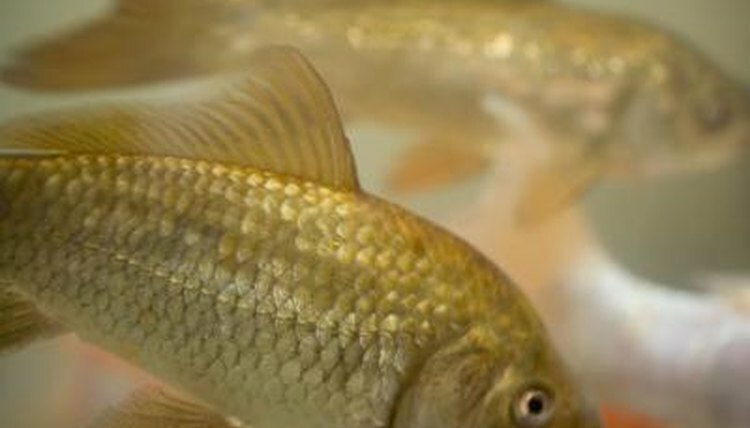 They are compatible with some types of warm-water fish, such as guppies, as long as the aquarist realizes that guppies are much smaller than goldfish and could end up as dinner for the bigger fish. Goldfish are also gentle fish, and this needs to be remembered when placing with other fish. Goldfish do well in non-heated aquariums as long as the aquarist keeps track of the tank temperature during the summer and does frequent cold-water changes on the worst heat days. Room temperature is fine for the goldfish, keeping in mind that if the temperature in the room goes up past 90 degrees, so will the temperature of the water. Keeping the ambient temperature down around 70 degrees is perfect for year-round goldfish health. Goldfish love a refreshing swim and will actually perk up and swim faster when fresh, cool water is poured into the tank. Changing out a quarter of the water from time to time with some that is many degrees cooler is perfect for the goldfish. This fish thrives in temperatures ranging from freezing all the way up to around 85 degrees, but will swim a lot slower at the uppermost and lowest ranges of temperature. Goldfish withstand life in an outdoor pond easily, just as long as the water is deep enough that it won't freeze all the way to the bottom. If that happens, all the goldfish will freeze right along with the ice, which is not what you want to find at the spring thaw. In a pond that is at least 3 feet deep, the fish will go into a partial hibernation and make it through the winter. Breeding goldfish requires a gradual rise from cooler water to warmer, imitating the spring thaw of an outdoor pond. If the aquarist wants the fish to spawn, the room temperature water must be partially changed out and cold water applied several times a week until the tank's water temperature stays around 38 to 40 degrees. After a few days, the aquarist should replace cooler water with warmer until the water is around 65 to 70 degrees.